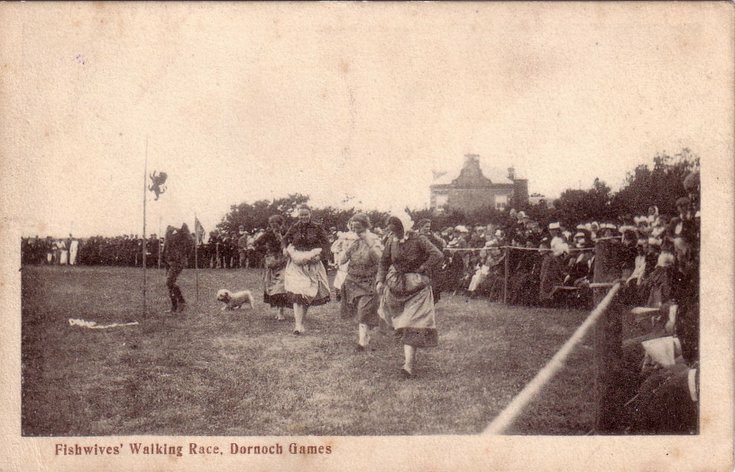 Monochrome postcard, from the Basil Hellier collection, showing the Fishwives' Walking Race at the Dornoch Games. The reverse has a Bedford address, but no postage stamp. It is overstamped with a Skegness collector's mark, dated 11 May 1974. I do not know the date of publication of this card, but my copy is postmarked at Dornoch on the 9th August, 1910. I should like to know the date of the event and any other information about it. The card was sent by Mrs. Mack(?) to a Miss Case in Bromley, Kent.